GARY WILLIAM JOHNSON was born on October 29, 1944, to George and Elsa (Maus) Johnson in Montevideo, Minnesota. He spent the first part of his childhood here before moving with his family to Belgrade, Minnesota. Gary and his brothers would often spend mornings before school doing deliveries for his father’s business, George’s Bakery. Directly after his graduation from Belgrade High School in 1963, he enlisted in the United States Navy where he served in Vietnam as a radio man. Following his honorable discharge four years later, he returned to Minnesota and attended a technical college in Detroit Lakes for two years to earn his degree in drafting. Gary held various construction positions in the following years but truly enjoyed the free time he spent playing guitar and singing in country bands. One of his greatest achievements was being called on stage to sing with “White Horse,” an event his future family would hear about for years to come. In 1983, Gary was performing with his band at a local dance when a woman in the crowd, Susan Long, caught his eye. Little did they know at the time, they would later be united in marriage on June 7, 1985, at the First English Church in Tyler, Minnesota. The couple made their home here and Gary worked for a time at a local bakery before beginning his 20-year career with the Minnesota Corn Processors. Being the hard-working man he was, Gary opted to continue working instead of retiring. He earned his boiler’s license and went on to be employed at Twin City Fan in Elkton, South Dakota and was currently employed at the Tyler Healthcare Center where he was always happy to help with all types of maintenance from miscellaneous repairs to painting walls. On Thursday, April 11, 2019, Gary passed away unexpectedly at the Avera Tyler Hospital at the age of 74 years, five months, and 13 days. Gary was baptized on December 3, 1944, at Zion Lutheran Church in Montevideo and was confirmed in the Lutheran faith on May 17, 1959, at Grace Lutheran Church in Belgrade. He was a current member of Grace Lutheran Church in Lake Benton, Minnesota and enjoyed singing in the “Men of Grace” choir. Gary and his brothers enjoyed singing and playing at their churches together and harmonizing as only brothers can do. Gary also frequently volunteered to play music for the residents at the Sunrise Manor in Tyler. He was a member of the American Legion. He loved any sort of competition and though it may have led to fewer willing Monopoly opponents, his family will always fondly remember the laughs they shared as they verified his creative Scrabble words. Gary’s competitiveness carried over to his true passion: fishing. 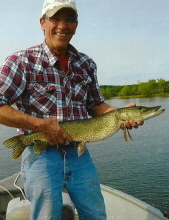 He earned the title of “The King” for always having the largest fish at the 40 annual fishing trips to Gull Lake he made with his brothers and was currently looking forward to the trip planned in May with his buddy, Caroll Friedrichs. Gary is remembered by his wife, Susan; children, David and Angie Johnson; step-children, Blake Long (Victoria Spencer), Sheila (Craig) Minett, and Mitchell Long; grandchildren, Rina, Noah, Danica, Keana, Taylor, Ethan, Kira, Austin, and Jordan Long, and Cody, Eric, and Merci Minett; brothers, Eugene (Yvonne), Dennis, David (Carol), and Mark (Janalee); brother-in-law, Jim (June) Herrington; and many nieces, nephews, and other relatives. He was preceded in death by his parents; brother, Leroy (Gerri) Johnson; parents-in-law, Donald and Shirley Herrington; and step-son, Shannon Long. To send flowers or a remembrance gift to the family of Gary W. Johnson, please visit our Tribute Store. Guaranteed delivery before Gary's memorial visitation begins. Guaranteed delivery before Gary's prayer service begins. Guaranteed delivery before Gary's memorial service begins. "Email Address" would like to share the life celebration of Gary W. Johnson. Click on the "link" to go to share a favorite memory or leave a condolence message for the family.